It’s time to believe in unicorns! 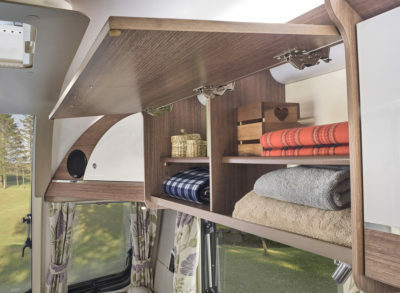 The new edition of Bailey’s best-selling caravan range, Unicorn, will be revealed publicly in September this year. 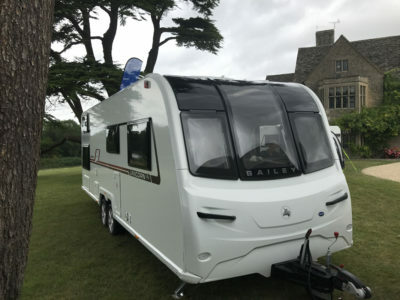 Bailey launched its fourth-generation Unicorn caravans in July at a special event attended by bloggers, vloggers, traditional print media, Bailey owners, and Bailey Focus group members. The new edition Unicorns are available in a choice of 10 layouts and follows a 15-month development programme, including feedback from Bailey retailers and owners about the current model range. Their responses lead to design concepts in 3D CAD software, then the building of prototypes, structural and thermal testing. Then followed European Whole Vehicle Type Approval and NCC (National Caravan Council) certification for legal and safety compliance. The aims of the Unicorn IV are layout optimisation, enhanced choices and enhanced practicality. 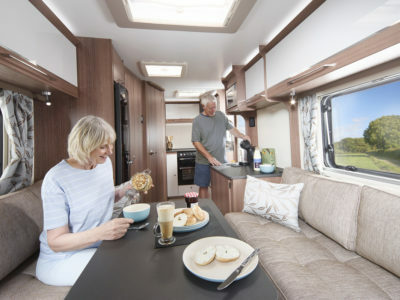 In simple terms, comparing with previous Unicorn models, front seating/beds are up to five per cent longer, fixed beds are up to 10 per cent longer and kitchen worktop space is up to 30 per cent bigger including a worktop-style hob cover. 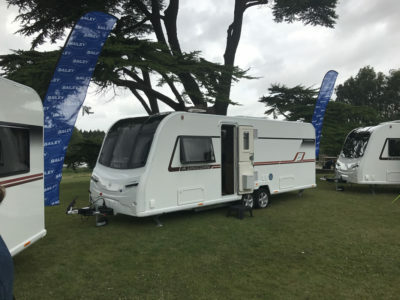 The model range features eight proven layouts, plus a new six-berth twin axle Segovia, the first family model in the Unicorn range, and a re-designed two-berth single axle Seville, the latter featuring spacious corner washroom and practical end kitchen. We’ll review those in more detail in the coming months. 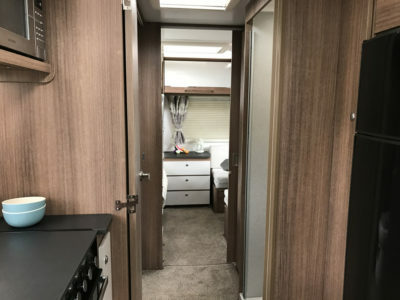 Most of the Unicorn layouts will be arriving at Bailey retailers from early September onwards, with the Madrid and Barcelona being showcased for the first time at the Motorhome and Caravan Show at the NEC in October. All Unicorns are now fitted with the latest safety and security equipment, helping to keep your caravan insurance premiums low. These include the AL-KO ATC Trailer Control System, AL-KO Secure wheel lock (two on twin axle models), TyrePal caravan tyre pressure monitoring and a new TRACKER Monitor Stolen Vehicle Recovery System with an integral intruder alarm as standard specification. Gone are the chunky arm rests and back rest as all caravans feature new domestic style sofa seating in the front lounge, available either the standard Brompton or cost option Finsbury fabrics, both of which come with a bolster and scatter cushions. 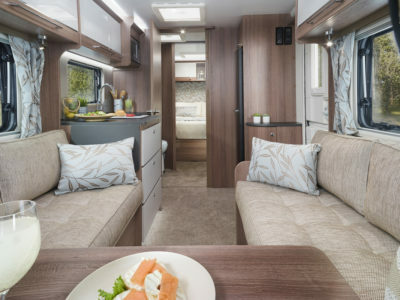 We’d have been disappointed if we hadn’t seen more than a mere nod in the direction of the award-winning Bailey motorhome interior; we weren’t. The new ‘Eucalyptus’ furniture finish is matched with complementary and contemporary ‘Agate Grey’ locker doors and drawer fronts and ‘Basalt’ stone worktops to produce fashionably light and spacious interiors which are highlighted by Bailey’s signature vertical front skylight by day and chic new LED mood lighting by night. 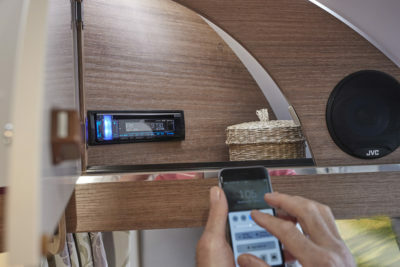 For those who survive solely in the digital world, there are practical touches throughout the caravan, such as the fitment of up to seven 230v sockets and eight USB charging points, an upgraded Bluetooth compatible sound system and wall pockets to store your devices or whilst charging them. 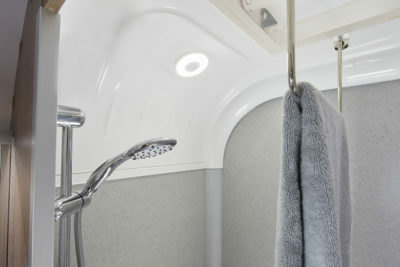 Shower rooms are bijou and thus perhaps lack in storage space compared with previous models. 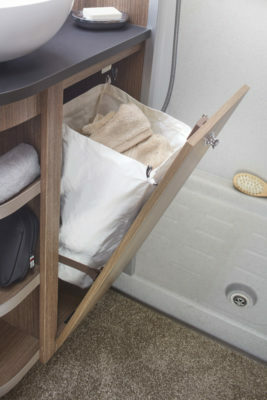 The in-built laundry bins will just about take underwear but there’s foldaway towel hanger in the shower. 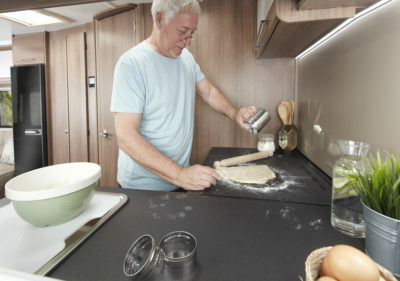 The extra worktop space in the kitchens will be welcomed by those who cook in the caravan, plus the extra bed and sofa lengths. 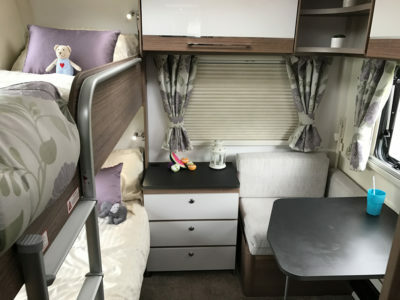 Hopefully, they will inspire an important new generation to become caravanners and motivate those who are returning to caravanning after a break to embrace the modern style of caravanning with domestic style influence. 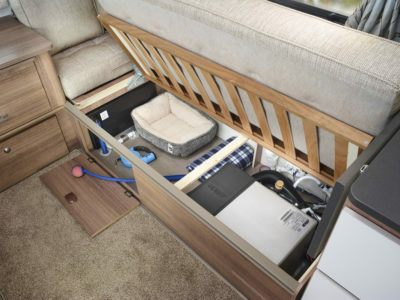 All Unicorn IV caravans are pre-wired for an optional motor mover, fitted by your dealer, and installed with a pre-built cable channel for optional roof mounted air conditioning. Exterior lockers are easier to access, and there are some model specific changes to lockers. 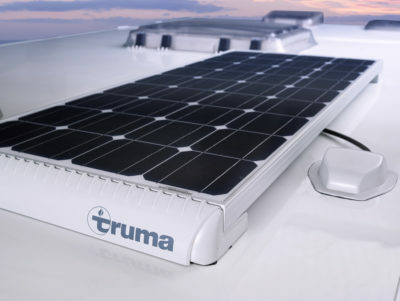 Heating is provided by Alde and there’s a roof mounted Truma solar panel for those who want to caravan off grid. Unicorn fourth generation are a cut above the previous range which has reigned supreme, and largely unchanged, for Bailey for three years. It looks set to be just as popular and award winning. 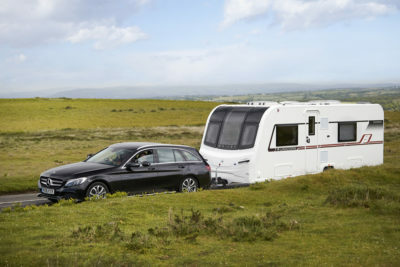 Prices include VAT at 20% but your retailer will charge a retailer delivery charge of up to £565 to cover the cost of various extra services, including delivery to the dealer’s premises, carried out before the customer takes delivery of the caravan. For more information visit www.baileyofbristol.co.uk.